Enjoy a great Low Black Ink Cost with the 105XL Cartridge! Features 3X the pages compared to Standard Yield! Genuine Lexmark supplies are engineered to work Best Together with your Lexmark printer, delivering excellent print quality from the first page to the last. Individual ink cartridges let you replace only the colour you need. 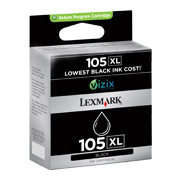 ¹ Based on the recommended retail price of 105XL black ink cartridge and its estimated average yield as declared on www.lexmark.com/yields in accordance with ISO/IEC 24711. Actual yields and prices may vary. Enjoy a great Low Black Ink Cost with the 105XL Cartridge! Enjoy big savings on what you print the most! Up to 510 Standard Pages in accordance with ISO/IEC 24711.